(Calgary) Street Church Ministries has been harassed for years now by City of Calgary officials who blatantly violate Charter protected freedoms. They have been arbitrarily denied permits without valid cause, denied access to the Calgary Stampede Parade, members have been arrested for reading from the Bible in public, and the ministry has received 39 tickets related to serving the needs of the poor. "I am amazed at that the City officials continue their blatant disregard for Charter protected freedoms and arrogantly trample on the rights of Christian Canadians. In Canada, we are guaranteed freedom of religion, freedom of association, freedom of assembly, and freedom of expression. The City of Calgary demonstrates that it does not care about the greater laws of this land. They have made themselves kings, have made their own anti-charter laws and have aggressively persecuted Christians under the guise of upholding the law. ", said Artur Pawlowski, Spokesman for Street Church Evangelistic Ministries. Artur Pawlowski and Street Church indicate that these attacks represent a greater trend of anti-Christian bigotry and are a prime example of what some people are calling Christaphobia. They are also very concerned about the wide sweeping consequences that will come from the unchecked powers of City officials. 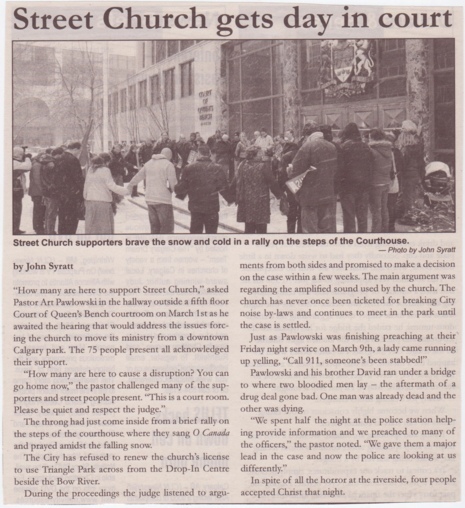 Street Church is also shocked at how the City of Calgary has misrepresented the facts, relating to this case, to the media and the public. "Mayor Bronconier, the City of Calgary, and other City officials, along with leaders of other cities, must be sent a message that these kinds of malicious attacks are not acceptable within a free and democratic society such as Canada". Concluded Artur. 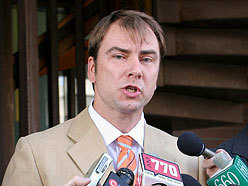 Artur Pawlowski filed a Human Rights Commission Complaint against the City of Calgary, Mayor Dave Bronconier, Bill Bruce – Chief BiLaw Officer, Michael Kenny – Manager Calgary Parks on Monday, March 10, 2008.